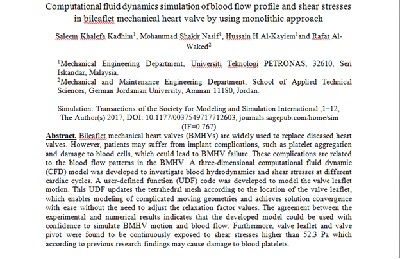 "computational fluid dynamics simulation of blood flow profile and shear stresses in bileaflet mechanical heart valve by using monolithic approach"
The goal of the search for the use of industrial mechanical heart valves (BMHV) is widely used to replace diseased heart valves. However, patients may suffer from transplant complications, such as plaque buildup and damage to blood cells that can lead to failure with a stroke. These complications are related to blood flow patterns In BMHV. The researcher developed a dynamic three-dimensional mathematical fluid (CFD) model for the investigation of hemodynamic hydrodynamics and shear stress at different heart cycles. The UDF was developed for the LED flyer model, and UDF updates the tetrahedral network according to the valve site, Enable complex mobile engineering modeling and achieve convergence solution with ease without having to adjust the values of the relaxation factor. The agreement between the experimental and numerical results indicates that the developed model can be used with confidence to simulate movement of the microscope and blood flow. Furthermore, the valve flyer and the valve axle are constantly exposed to shear stress higher than 52.3 pascal according to the results of previous research may cause damage to the platelets.